Using the Hubble Space Telescope, astronomers have viewed for the first time an asteroid with six comet-like tails of dust radiating from it. Astronomers viewing our solar system’s asteroid belt with NASA’s Hubble Space Telescope have seen for the first time an asteroid with six comet-like tails of dust radiating from it like spokes on a wheel. Unlike all other known asteroids, which appear simply as tiny points of light, this asteroid, designated P/2013 P5, resembles a rotating lawn sprinkler. Astronomers are puzzled over the asteroid’s unusual appearance. Jewitt leads a team whose research paper appears online in the November 7 issue of the Astrophysical Journal Letters. P/2013 P5 has been ejecting dust periodically for at least five months. Astronomers believe it is possible the asteroid’s rotation rate increased to the point where its surface started flying apart. They do not believe the tails are the result of an impact with another asteroid because they have not seen a large quantity of dust blasted into space all at once. Scientists using the Pan-STARRS survey telescope in Hawaii announced their discovery of the asteroid August 27. P/2013 P5 appeared as an unusually fuzzy-looking object. The multiple tails were discovered when Hubble was used to take a more detailed image September 10. When Hubble looked at the asteroid again September 23, its appearance had totally changed. It looked as if the entire structure had swung around. “We were completely knocked out,” Jewitt said. Careful modeling by team member Jessica Agarwal of the Max Planck Institute for Solar System Research in Lindau, Germany, showed that the tails could have been formed by a series of impulsive dust-ejection events. She calculated that dust-ejection events occurred April 15, July 18, July 24, August 8, August 26 and September 4. Radiation pressure from the sun stretched the dust into streamers. Radiation pressure could have spun P/2013 P5 up. Jewitt said the spin rate could have increased enough that the asteroid’s weak gravity no longer could hold it together. If that happened, dust could slide toward the asteroid’s equator, shatter and fall off, and drift into space to make a tail. So far, only about 100 to 1,000 tons of dust, a small fraction of the P/2013 P5’s main mass, has been lost. The asteroid’s nucleus, which measures 1,400 feet wide, is thousands of times more massive than the observed amount of ejected dust. 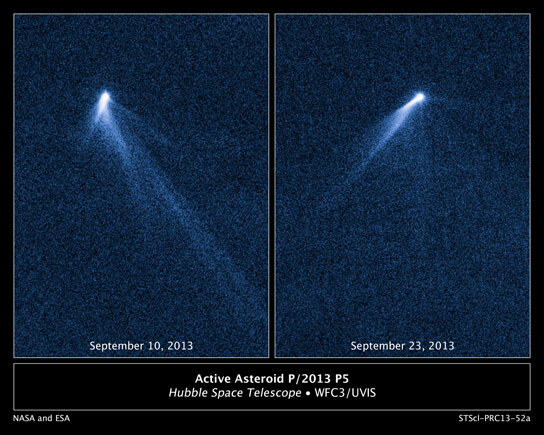 Astronomers will continue observing P/2013 P5 to see whether the dust leaves the asteroid in the equatorial plane. If it does, this would be strong evidence for a rotational breakup. Astronomers will also try to measure the asteroid’s true spin rate. Jewitt’s interpretation implies that rotational breakup must be a common phenomenon in the asteroid belt; it may even be the main way small asteroids die. Jewitt said it appears P/2013 P5 is a fragment of a larger asteroid that broke apart in a collision roughly 200 million years ago. There are many collision fragments in orbits similar to P/2013 P5’s. Meteorites from these bodies show evidence of having been heated to as much as 1,500 degrees Fahrenheit. This means the asteroid likely is composed of metamorphic rocks and does not hold any ice as a comet does. Be the first to comment on "Hubble Sees an Asteroid with Six Comet-Like Tails"